Striker set for Aston Villa stay | The Transfer Tavern | Where football transfer rumours fly or die! Darren Bent’s future has been discussed for quite some time here at the Football Transfer Tavern, and Matt Law of the Daily Mirror has stopped by to give our punters an update on the striker’s future. 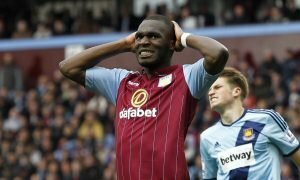 It is understood that former Ipswich Town, Charlton Athletic and Tottenham man Bent will not be allowed to leave Villa Park, despite struggling for first team football this term. The club’s record signing has played second fiddle to Belgian summer arrival Christian Benteke all season, and is reportedly desperate to leave the Midlands club. QPR and Reading have both enquired about the England international striker, but Paul Lambert has knocked both his relegation rivals back, telling Bent he is staying put. Clubs are reluctant to pay a large fee for Bent, who at 28-years-old cost Villa £24 million almost exactly two years ago from Sunderland. Villa are unlikely to recoup anywhere near that fee should they allow him to leave, so Lambert is set to keep him for the relegation run in. Villa fans. Should Lambert be starting an experienced striker such as Bent instead of leaving him on the sidelines? Vote in our polls below.